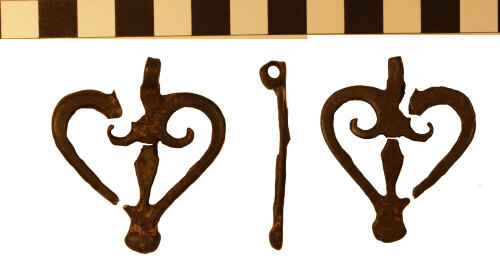 Two fragments from a copper-alloy pendant, possibly a terminal pendant from a sword belt dating to the late second or third century AD. The pendant is leaf-shaped with an expanded rounded terminal at one end and an attachment loop at the other. The pendant measures 47mm in length and a maximum of 36mm in width. The pendant weighs 9.1 grams. 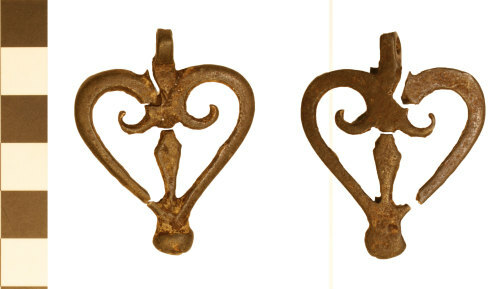 For an extremely similar pendant from Stockstadt see Oldenstein 1976, 247 and Taf. 32).